My daughter Lizzy LOVES chocolate chip muffins. All summer we went to the grocery store and bought her the store-brand muffins -- small, fluffy, oily things. They weren't that bad. They weren't that good. When school came around again, I said "Let's not buy muffins. Let's make them for home and for school, to bring to the first advisory of the year." Advisory happens twice a week. A small group of students meet with their advisors to talk about school, social stuff, and anything that's on people's minds. Lizzy has her advisory group, as does Christina. I have an advisory too, since I'm an advisor to a group of AWESOME 10th grade girls. I looked on foodgawker and found a recipe at blogchef.net, which also happened to be the same recipe on Recipezaar. I made a double batch and came up with 24 muffins, golden brown and chock full of chocolate chips. Just enough to feed the three advisories and leave NOTHING for home. Oh well. Looks like we're baking tomorrow night! Note: The fat in these muffins are butter, and as you know, butter hardens when it gets cold. If you can, put these in the microwave for a few seconds to re-melt the butter in the muffins and get that just baked experience. If you want them softer all the time, I imagine that you can replace all or some of the butter with oil, which stays in liquid form regardless of temperature. Step 1: Preheat the oven to 400 degrees. Grease 12 muffins cups (or muffin tins). In a large bowl mix together flour, white sugar, brown sugar, baking powder and salt. Step 2: In another bowl stir together eggs, milk, butter and vanilla until well blended. Make a well in the center of the dry ingredients. Pour the milk mixture into the well and stir until well combined. Lightly stir in chocolate chips and chopped nuts. Step 3: Spoon batter into muffins cups or tins. Place into the oven and bake for 15-20 minutes or until a toothpick comes out clean. Remove from the oven and allow to cool for 5 minutes. Just beautiful. I love muffins. 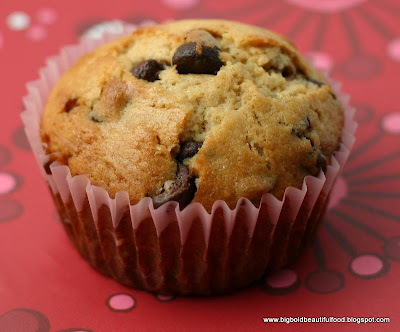 Always eating 2-3 at a time :P Chocolate chip muffins are my favorite! Mmm....imagining them still warm from the oven and warm/gooey. I heart chocolate! 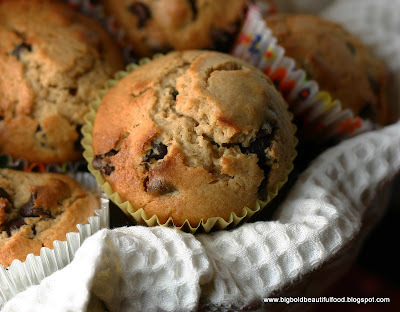 Your chocolate chip muffins look fantastic & so yummie!! These look fantastic! Good for you (and Lizzy) to make them on your own! p.s. that bolognese looks INCREDIBLe too!